Eliminate struggle. 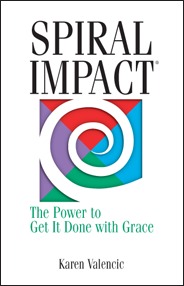 Harness the power of the spiral to achieve your desired outcomes – and do “it” with grace and ease. Karen Valencic blends her expertise in the martial art aikido, with performance improvement, and science. She illustrates how to use conflict creatively, focus energy and make solid decisions to generate the power to get what you want done with grace.